This pot has been decorated with M-Seal flowers and leaves. I have used white M-Seal as it takes longer to set and makes it slightly easy to work. M-Seal is a sealant and dries very fast. One has to take small quantities and mix the two parts as it dries very quickly . 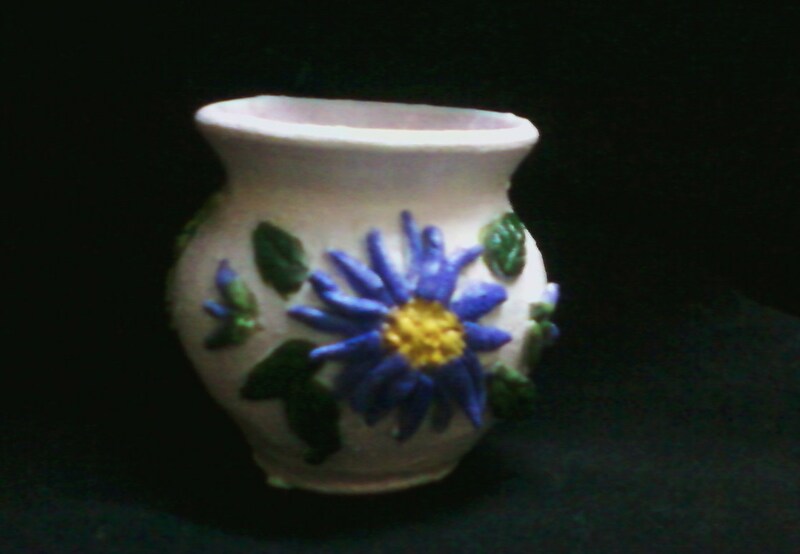 After painting the pot I used a small quantity of M-Seal to make the petals by rolling out a long string. Powder on my hands definitely helped ! I have used small lengths of M Seal strings and immediately stuck them in position. After putting all the petals I made the center and made indentations on it to give it texture. Leaves are simple enough , I have made veins with a knife. I was happy that all the M Seal got used instead of turning into a hard lump!